Grand Rapids, Mi. 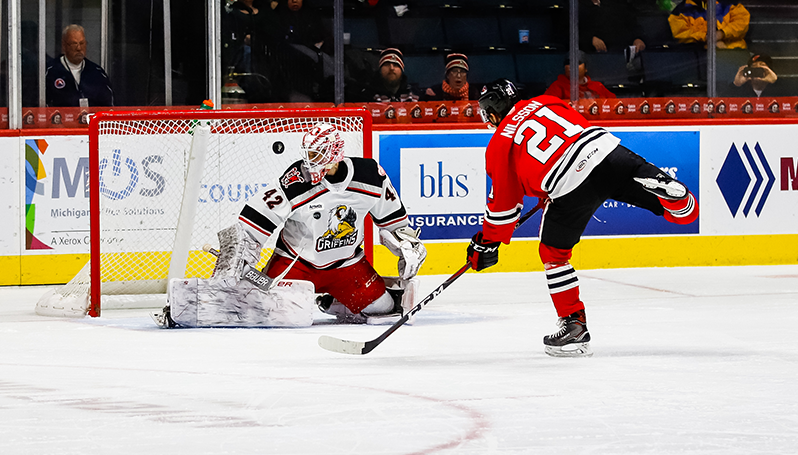 - Jacob Nilsson netted his second goal of the season, but Filip Zadina tallied twice to help the Grand Rapids Griffins down the Rockford IceHogs 3-1 in a school-day matinee Wednesday morning at Van Andel Arena. Collin Delia stopped 31 of 33 shots in the loss, extending his save total to a league-high of 330. The 24-year-old netminder now boasts the AHL’s eighth-lowest GAA at 2.37 and ranks third in the league with a .932 save percentage. Nilsson tallied the IceHogs’ lone goal to even the game with 50 seconds remaining in the second frame. Nilsson collected a drop pass from Nathan Noel on the rush and fired it under the crossbar to beat Grand Rapids goaltender Patrik Rybar. Zadina broke the tie at the 3:41 mark of the third period, firing the eventual game-winner past the glove of Delia. Turner Elson then iced the game for the Griffins on an empty-netter with 14 seconds remaining, closing the door on a late push from the IceHogs with the goaltender pulled. The loss snapped Rockford’s season-high five-game road winning streak.